But I wonder how you’re supposed to find a snack asteroid among all other asteroids? Are there signs pointing towards it? Or does the snack asteroid have a big, glowing sign on it that we can’t see in this comic? 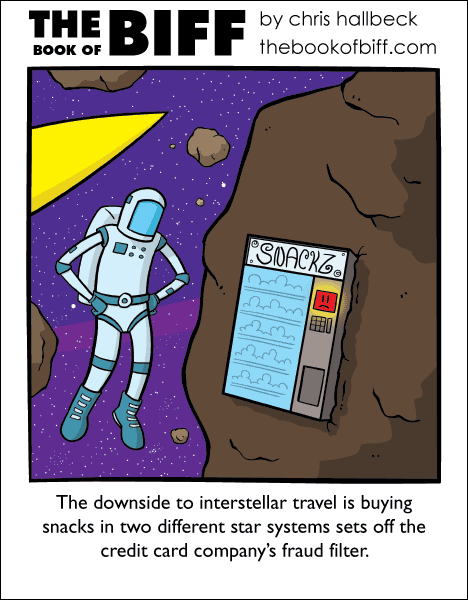 Maybe there are many snack asteroids? Down in Texas, some of the Rest Areas have vending machines sitting out practically automobile accessable, by placing them in little concrete boxes, and behind bars, like little jail cells. The bars are wide enough to operate the buttons, and retreive your food and drink, but keep you from ransacking the machines otherwise. I’ve only had this happen once, oddly enough, but it took me a very long time to catch on to the fact that the gas pump shutting off at $75.00, while driving the company truck, was intended behavior. You don’t even need to travel. Being in the UK and spending money in dollars, yen, euro, sterling and a handful of other currencies gets you on the fraud list every few months. Can’t complain tho, apparently I’d made several donations to church and topped up a mobile phone (that I don’t own) but the clincher that triggered the fraud line was the fact that apparently I’d also booked a holiday on my credit-card.